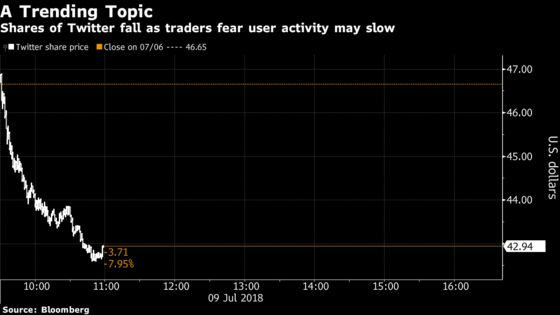 (Bloomberg) -- Twitter Inc. plummeted on investor concern that the company’s escalating fight against fake accounts will slow user growth. The Washington Post said Friday that the company’s rate of account suspensions has more than doubled since October 2017, and that Twitter has suspended more than 70 million accounts in May and June. The stock fell as much 9.8 percent Monday, the biggest intraday decline in more than three months, before paring the loss later in the day. The Post’s report echoes Twitter’s own disclosures from two weeks ago, when the company said its machine learning algorithms had identified more than 9.9 million potentially spam or automated accounts a week as of May, an increase from 3.2 million a week last September and more than triple the number from a year earlier. The company said it’s conducting an audit to ensure that every account created on Twitter has passed a security check to prevent bots from gaining access to the social media platform. The change has already stopped more than 50,000 spam sign-ups a day, according to Twitter. A Twitter spokesman said the Post’s numbers confirm what the company had released on June 26 and “we have not and do not include spam accounts that we have identified in the active user numbers that we report to shareholders.” The company, in its first-quarter earnings report, also highlighted that the number of reported monthly active users would be “negatively impacted” by the continuing effort to rid the service of fake accounts. Improvements to Twitter spam and fake account detection follow criticism that the service allowed harassment and manipulation to run rampant, as the company prioritized user and revenue growth over safety. Lawmakers berated Twitter for how long it has taken the company to discover the millions of tweets from Russian-linked accounts that meddled in the U.S. elections. A former employee told Bloomberg last year that in early 2015 the company discovered a vast number of accounts, most of which were inactive or fake, with IP addresses in Russia and Ukraine, but failed to delete them. Twitter Inc. rose 6.8 percent last week, coinciding with a positive note from Wells Fargo analyst Peter Stabler, touting the company’s success with video content. The shares declined 4.9 percent to $44.37 at 1:40 p.m. Monday in New York.